THE ASB-10 IS the follow-up to Monitor Audio’s magnificent ASB-2, the first of a new breed of premium soundbars that combined classy design with powerful performance. This is a simpler and more affordable beast, stripped of its predecessor’s AirPlay streaming and HDMI ports in favour of Bluetooth, optical, coaxial and 3.5mm analogue inputs. 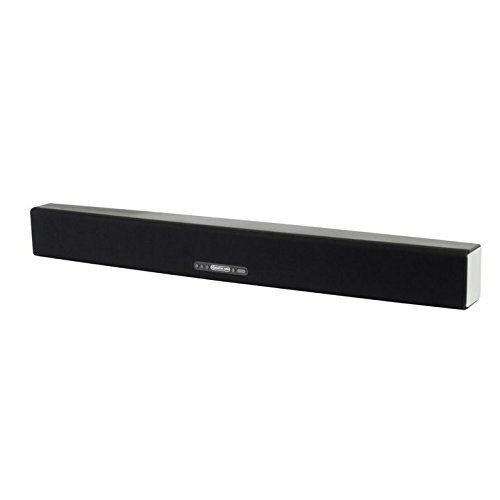 The soundbar can be happily used on its own – Monitor Audio says it delivers ‘ample levels of bass’ – but for added oomph you can add the purpose-built WS-10 subwoofer (not pictured). Unlike the big, bulky ASB-2, the ASB-10 is a living-room friendly ‘bar that hogs less TV-stand space. That said, at 99mm high there’s a chance it could block your TV’s remote sensor. Measuring just under a metre wide, it was well-suited to my 55in set but would be dwarfed by anything bigger. It’s beautifully styled in a moulded polymer cabinet with a black cloth grille and brushed aluminium end caps. Weighty, solid and seamlessly built, this is everything I’ve come to expect from Monitor Audio speakers. Tiny buttons on top provide control and a single pill-shaped LED conveys its status. Simple. An LFE output on the back lets you hook up a subwoofer of your choice, but naturally MA wants you to buy the WS-10. This bass box makes up for in versatility what it lacks in style – with its 2.4GHz wireless connection you can place it anywhere, either vertically or horizontally on rubber feet. It’s equipped with an 8in C-CAM driver and a 120W amp. Movie, Music and Impact modes tweak the EQ to suit your taste. The two-channel soundbar is kitted out with four 3in C-CAM mid/bass drivers, a pair of 25mm C-CAM gold dome tweeters and two passive bass radiators. Power comes from four discrete Class D amplifiers (100W total) with DSPs providing precision filters and processing for each driver. Alongside Dolby Digital decoding is Dolby Virtual Speaker, which aims to create a ‘3D soundscape’. The remote is a nice size but its spongy buttons sometimes need a couple of presses to register. With the WS-10 in play, the ASB-10 has no trouble generating a massive soundstage. The scenery-bending fight scenes in Doctor Strange are backed by a deep rumble as buildings shift and fold. The sub easily conveys scale, but doesn’t distract or give away its position. It’s well integrated, punching hard and tight as the characters wreak havoc in Hong Kong. Further up the frequency range, the ASB-10 bears all the hallmarks of a Monitor Audio speaker. High-frequency reproduction is exquisite, digging out tricky vocal inflections and subtle textures with ease. It’s a silky, undemanding listen – explosions and smashing glass have harsh edges smoothed off. A little more attack wouldn’t go amiss, but at least it doesn’t give your eardrums a bashing like some budget soundbars might. Dialogue is clear and beefed up nicely by the subwoofer during Strange’s confrontation with the thunder-voiced Dormammu. The soundstage is broad but not ‘surround sound’, despite the efforts of Dolby Virtual Speaker. All good stuff. But if you’re planning to save yourself and side-step the subwoofer, you might want to reconsider. On its own, the ASB-10 lacks the low- frequency muscle that movies thrive on, reducing impact and cohesion. To be fair, the C-CAM drivers do muster a reasonable amount of bass, which is fine for TV shows and music, but movie fans seeking blood and thunder will be disappointed. Apple HomePod review: APPLE’S WAY OR THE HIGHWAY. Reolink Argus 2 Review: The missing link in home security?